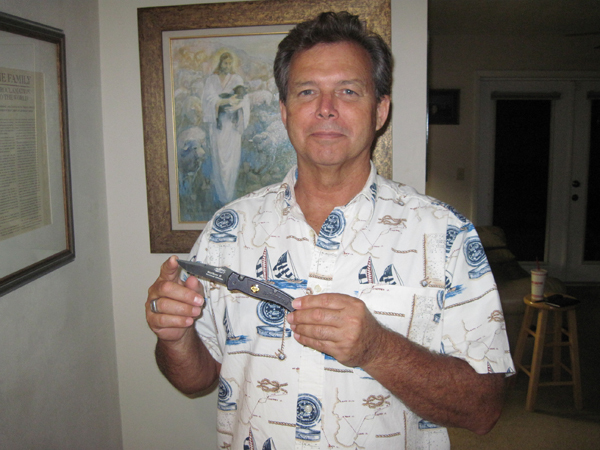 Riverview resident Mike Perry poses with “Not on My Watch” Mike Perry Chief Engineer Striker 2 knife commemorating his heroic actions on the Maersk Alabama in 2009. Riverview resident Mike Perry didn’t ask for fame, but acts of bravery while working as the chief engineer on board the Maersk Alabama in April of 2009 has led to acclaim and commendation for his actions. Perry and his fellow shipmates valiantly fought off Somali pirates that attacked the ship and captured its captain. To commemorate Perry’s valor, a replica of the knife he used to subdue the pirate ringleader has been created and is now for sale. The knife, designed by Randall King Knives in North Carolina, features a 3 1/8” steel CPM 154 blade and 4 3/16” handle made of aircraft-grade aluminum. The phrase “not on my watch” is inscribed on the blade. Perry says that expression is the heart and spirit of the piracy experience and those words echoed through his mind during his ordeal. Retailing for approximately $250, the knife is sold through local authorized distributors and can be purchased as either an automatic or manual knife. A portion of the proceeds from each sale was supposed to be paid to Perry, but he politely declined. He is donating any earnings to Tony Fowler, an employee at the knife company, who established Christ is Hope Foundation, a mission supporting families who have felt the bitter sting of financial issues due to unemployment. Perry joked that Tony is cheering for them to sell a million knives. Perry retired from Maersk Line Limited and now enjoys traveling the country on his Honda Ridgeline motorcycle. He also is devoted to his church, The Church of Jesus Christ of Latter-day Saints, and works at its local food pantry and in the Orlando temple every week. For more information about where you can purchase the knife, e-mail Randall King Knives at randall@randallkingknives.com. To learn more about the company, visit www.randallkingknives.com.